The photo is annotated with a '6' in the same distinctive way as a photo published in 'Brentford Past' and 'The Archive Photographs Series Brentford' books. The caption indicates the published photo was taken in 1925, suggesting Sandra's photo is also from this year. There are around 40 boys in the class and two adults stand at the back of the classroom,including the headmaster, Captain Lenoard Revell. 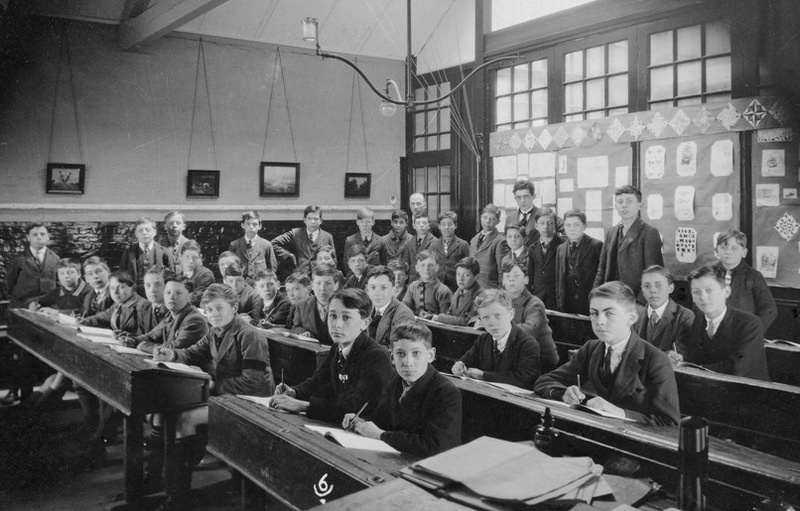 He also appears in the c. 1921 photo showing Bill Healey's class. Arthur Healey is 2nd row back, 2nd from right. Headmaster Captain Leonard Revell Master, or possibly an older pupil? Alan Jutson, May 2014 added 'I believe my father is standing second person from the left against the wall - Donald Jutson'.